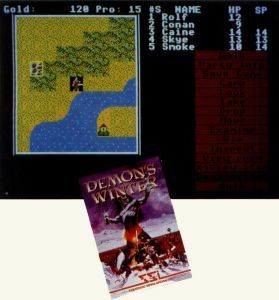 Now available for the Atari ST is SSI's (Strategic Simulations) fantasy-adventure game Demon's Winter, in which your five-character party may consist of dwarves, elves or dark elves. Each character has his own speed, strength, intellect, endurance and skill levels. Each of these attributes can be increased by collecting experience points. Characters can be from one of many different classes, including barbarian, thief, wizard and scholar. In Demon's Winter each character has his own speed, strength, intellect, endurance and skill levels. Each of these attributes can be increased by collecting experience points. Demon's Winter is distributed by Electronic Arts under its Affiliated Labels program and is priced at $39.95.